Home » Articles » Local » Music from The King of Pop Filling RME Once Again! Music from The King of Pop Filling RME Once Again! Start practicing your moon walk and make plans to celebrate the King of Pop this Friday night! 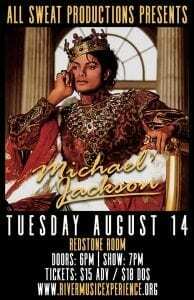 Back by popular demand, All Sweat Productions is bringing back music of Michael Jackson to the Redstone Room at River Music Experience (129 Main St. Davenport) once again this Thursday Aug 14. Doors open at 6 p.m. and the show begins at 7 p.m. This is a 19+ show (minors must be accompanied by parent or guardian). Come enjoy classic Michael Jackson hits performed by the best musicians in the area. With a chart history like The Gloved One has, you’re bound to be singing along and reminiscing in no time. General admission tickets to this unforgettable evening are $15 ($18 on the day of the show). The Redstone Room at River Music Experience is a standing room only concert venue. However, a limited number of reserved tables with seating are available. If interested in reserving a table, make sure you add both your general admission ticket and the reserved table when purchasing online. You can purchase you tickets online at https://www.eventbrite.com/e/all-sweat-productions-presents-michael-jackson-ii-redstone-room-tickets-47688868690. For more information on this event, visit http://rivermusicexperience.org/Upcoming-Events/Calendar-of-Events/All-Sweat-Productions-Presents-Michael-Jackson-II. Do not miss this fun-filled evening of celebration for one of the music industry’s greatest legends.